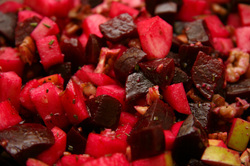 Boil beets until soft. Cool with cold water and peel with your hands. Cut into cubes. Cube and blanch the apples. Combine with parsley. Combine the rest of the ingredients and dress the salad. Salt and pepper to taste.